Clutch repair and replacement is one of the most frightening types of job most drivers find they might need on their vehicle. This is mainly because it’s a delicate, time-consuming and therefore, expensive job. Pretty much any motoring and mechanics expert will tell you that there is no such thing as an ‘average’ lifespan for a clutch, simply because of the huge variations in how people treat their vehicles (i.e. the amount of abuse and rough treatment to which they’re subjected), and more importantly, how much wear and abuse their clutch is subjected to. What can make clutch problems even more difficult is that there is no such thing as a typical lifespan for them. 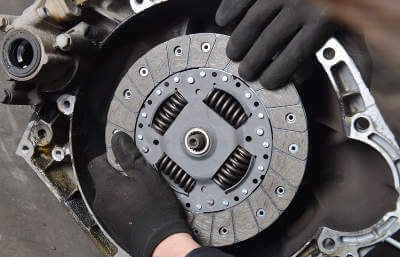 But as with many other car components, massive leaps in the quality and technology which go into producing the materials which comprise the working parts of a clutch have meant that it’s common for a clutch assembly to last for 75,000 miles. But as Warrantywise also notes, this potentially long interval between replacements makes it even more important that a clutch mechanism is treated with respect and care in order to ensure that it stands the best possible chance of achieving this kind of lifespan. It also makes the regular inspection and maintenance cycle even more important, so that potential problems can be spotted early and nipped in the bud, or the appropriate steps can be carried out to prolong the life of the parts involved. The simple reason why you will never find a clutch mechanism covered by a manufacturer’s warranty is because it’s impossible to tell in most cases whether some form of misuse or abuse caused a failure. So car manufacturers will err on the side of caution, and write specific exclusions into their warranties, leaving the vehicle’s owner to shoulder the entire cost, unless a specific manufacturing fault can be proven to have contributed to the problem - and that’s very difficult, although it was the case with some Volvo models in 2011, so it’s by no means unheard of. Frequent use of a clutch when it isn’t necessary greatly increases the wear on the mechanism’s moving parts, and can cut its life to a fraction of what it should be. It was once common for drivers to ‘ride the clutch’ of their car when they were stood for short periods of time, such as at traffic lights. That is, they would leave their foot on the clutch at the precise point when the engine’s revs die down, and the car feels as though it is about to move forward. This was, and still is, a favourite technique of drivers who want to make a quick getaway from the lights. But it’s incredibly bad for the clutch, as it prematurely wears down the friction disc, which makes it more difficult for the clutch to adjust its speed so that it is rotating at the same rate as the flywheel, as is needed if you’re to be able to change gear smoothly. When the friction disc and flywheel find it difficult to rotate at the same speed, this creates what’s known as ‘clutch slip’, as they struggle to engage, and ultimately, this will mean that the clutch needs to be replaced. Slipping also causes increased friction between these moving parts, and so creates a ‘Catch 22’ situation, whereby the more it happens, the more quickly the clutch is being worn. Frequent use of any vehicle for towing also puts greater strain on these moving parts, so if you regularly do this kind of driving, you should expect your clutch to wear out more quickly than on an equivalent vehicle which isn’t used in this way. In extreme cases, the build-up of heat becomes so much that the clutch pressure plate becomes brittle and may even shatter. When you press the clutch pedal suddenly, it creates extra wear on the friction disc of the clutch, and makes slipping more likely. So gentle pressing and releasing of the clutch will reduce the wear caused when it slides into place up against the flywheel. So changing gears carefully, so that your clutch isn’t suddenly pressed against or pulled away from the flywheel helps prolong the life of all the moving parts of the system. As a result of the points mentioned above, we can therefore pinpoint general types of vehicle which are more prone to clutch failure than others. Any vehicle which tows a trailer, or which is regularly driven up and down steep hills, will experience quicker wear and therefore need more regular clutch replacement. So while it’s impossible to generalise about makes and models which might be more susceptible to premature clutch wear than others, it follows that larger vehicles, and particularly those equipped with four-wheel drive suffer from a higher level of incidence of clutch failure than average. To try to reduce the problem, it’s wise to get a good feel for exactly how much acceleration is needed to move a car forward on all types of road and gradient, and avoid the temptation to apply more power than is necessary. Is My Car At Higher Risk Of Clutch Failure? As we mentioned above it’s difficult to say for sure whether any make is at higher risk. However, one of the most reliable ways of judging how frequently any car suffers clutch failure is through the reports submitted to motoring ‘agony uncle’ Honest John. Towing is one of the most common circumstances in which clutch failures occur, and his team received reports of just such a case on a Honda CR-V - usually a car which is highly recommended for such work. Further advice from the Honest John team has suggested that, if a clutch fails within six months of a new owner taking possession of the vehicle, it might be possible for them to claim the cost of a clutch replacement against the garage which sold them the car. This is because the owner can argue that the garage should have known about the condition of the clutch and its various parts when it sold it. His investigations team has also encountered higher than average failure rates on a selection of Ford cars, including the Fiesta, Focus and C-MAX, while the Mitsubishi Outlander and Hyundai i20 have also been flagged up for being susceptible to early clutch failure. Another common cause of clutch problems is the use of a part known as a dual mass flywheel. This is a mechanical device which rotates to provide continuous energy in order to reduce the effects of unwanted vibration in an engine caused by sudden variations of speed or engine revs. These flywheels can have a widely varying lifespan, and again a major factor influencing this is the style of driving to which they’re subjected. The rougher the ride they’re given, the less time they’re likely to last, with the Honest John guys putting their lifespan at anything between 40,000 and 200,000 miles. The big lesson from all this is that you never can tell how long your car’s clutch is going to last. But you can help its cause by being gentle when you use it. If you need clutch replacement or clutch repairs, getting quotes for the work through MyCarNeedsA.com takes away a lot of the stress involved. You register on the site, then post details of the job you need doing, and garages in your area will contact you with a quote for the work needed. It’s then up to you to negotiate with them when you have the work done.